Researchers at Stanford University have developed a novel way to create a new form of carbon neutral cement by studying the formation of coral reefs and applying the principles at work. Coral takes in minerals and CO2 and then secretes calcium carbonate to build its hard exoskeleton. Inspired by this construction process, Stanford scientist Brent Constanz has developed a way to capture CO2 and dissolve it in seawater to form calcium carbonate, which has properties suitable for use in construction and could replace Portland cement (which is responsible for more than a ton of CO2 for every ton of product created). This new technology could reduce the environmental impact of construction in a big way by capturing and sequestering CO2 emissions while creating a durable building material. Constanz was appalled to by environmental footprint of the cement industry, so he decided to direct his research as a biomineralization expert towards finding alternatives. Coral’s skeleton is made up of calcium carbonate, which can be easily synthesized by dissolving CO2 in seawater to form carbonate and then mixing it with calcium to form a solid. This technology is an amazing example of biomimicry that represents a big win for the environment. Calera is the spin-off company that Constanz created to develop and market his technology. 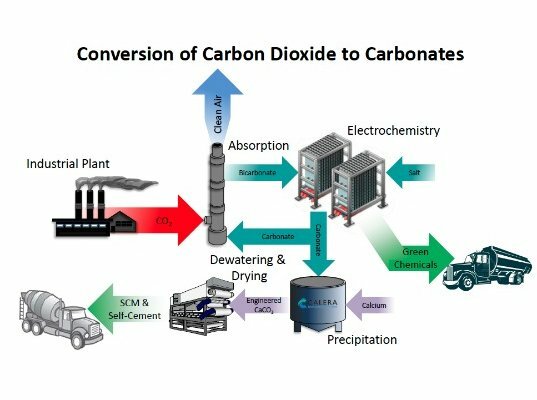 They already have a plant set up in California’s Monterrey Bay that takes waste CO2 gas from the local power plant at Moss Landing to create calcium carbonate. This product can then be used to replace portland cement. Every ton of cement replacement produced by Calera avoids the release of approximately one ton of carbon dioxide that would otherwise be emitted by the traditional manufacturing of Portland Cement. This process does NOT produce cement - it produces calcium and magnesium carbonates which are the raw materials in the cement manufacturing process. By the way, the calera process results in acidifying the seawater. latest technology.....i never knew it before..thanks for the information. ...could replace Portland cement (which is responsible for more than a ton of CO2 for every ton of product created) Say what?? ?